Riding to the Yahoo! Developer Summit, I met Chris from Ask.com, asked where to go, and he showed me the way. 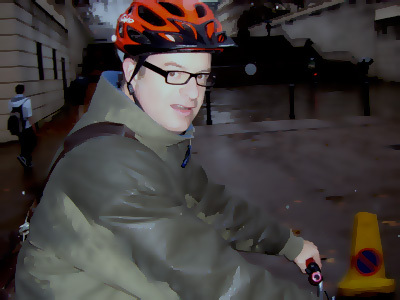 Chris told me about his urban assault commute in London and we rode in traffic, sidewalks, crossing roundabouts, and most of it was a blur, but I arrived intact and safely. It was raining, 40 degrees, and I felt right at home. The wrong side of the road thing confuses me most at intersections and roundabouts, so I just wait for other cyclists and see where they go.